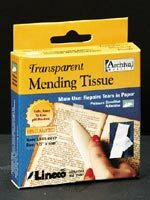 This very thin, strong acid-free tissue is used for repairing tears in paper. Features a non-yellowing adhesive. Size: 1/2" x 50 ft.